Residential fences are permitted on the property lines in residential districts but shall not exceed a height of six feet; shall not exceed a height of four feet in the street yard and shall not be closer than two feet to any public right-of-way. No building or zoning permits are required but property owners are responsible for complying with the above regulations. 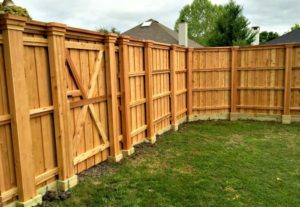 Note that homeowner’s associations such as Wind Meadows may be more restrictive when it comes to fences and it is recommended that you review its bylaws or contact the association before planning to build a fence.